A view of the Königsberg Cathedral in Kaliningrad. When you find yourself wiping raindrops from your sunglasses, it is likely you will be somewhere close to the Baltic Sea and the beautiful coast of the Kaliningrad Region. 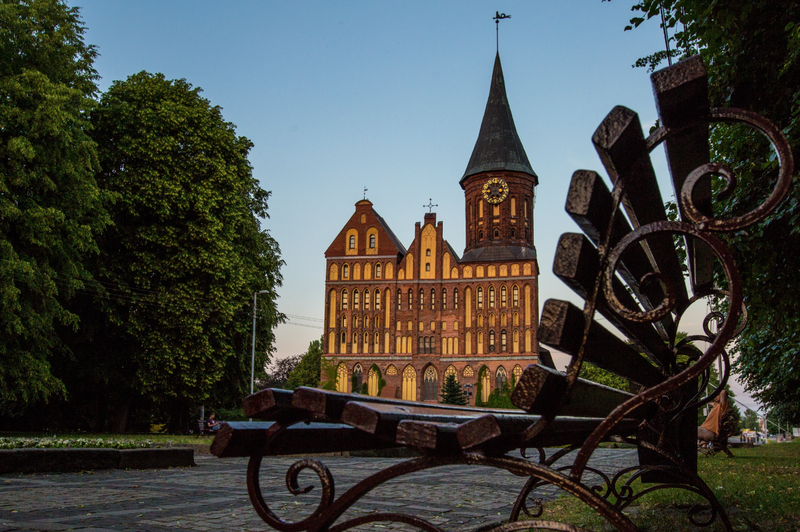 Nestled snugly between Poland and Lithuania, the Kaliningrad region boasts mild winters and a capricious summer that attracts many thousands of tourists every year. Imagine sipping from a thermos full of hot tea in August, gazing at the setting sun as it transforms the sky from bright orange to deep purple, with your toes in pearl coloured sand; this is Kaliningrad. Kaliningrad became part of the Soviet Union after World War II, after the Potsdam agreements of 1945 were signed. Passionate about the area’s historical past, the local citizenry prefer to call modern Kaliningrad by its original German name, Königsberg. A neighbour to several European countries, Kaliningrad does not share any land borders with Russia, making this region unique in many ways. The Russian people inherited fresh sea air, pine forests, golden dunes, traditional German houses and lands imbued with a rich history. The best way to begin exploring Kaliningrad has traditionally been by paying homage to the great philosopher Immanuel Kant. The original resting place of the father of metaphysics was inside the Königsberg Cathedral. A number of large gates that lead to the city’s main thoroughfares are part of Kaliningrad’s special charm. There are three “must see’’ gates in Königsberg, each located close to the other: Sackheim and King’s Gates on Litovsky Val and Rosgartener Gate on Vasilevskogo Square. If you are looking for a little adventure, take a trip outside the center to Nevskogo Street. Here you can explore the mysterious dungeons of Fort №3 (King Friedrich-Wilhelm I). This stone citadel was built along an encroaching forest and was the largest fort in a defensive ring surrounding Königsberg. Be sure to bring flashlights and comfortable shoes, as it is abandoned and there is no formal tourist infrastructure. The less intrepid can head to Fort №5 (King Friedrich-Wilhelm III) for a guided tour. Get a taste for old Kaliningrad at the Altes House Museum Apartment (12 Pugacheva Street). Be prepared to solve puzzles, enjoy amazing stories and listen to a harmonium while surrounded by antiques that have been acquired from old attics, flea markets and auctions.